The app, Trinity Live, centralises several student resources, and was designed by four computer science students. 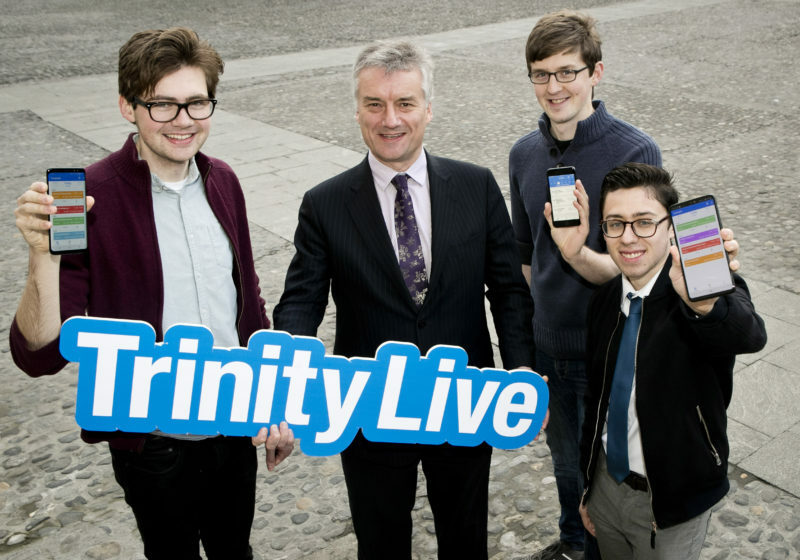 Students will be able to access their timetables, exam results and College ID on a new app, Trinity Live, launched today by Provost Patrick Prendergast. The app was designed by four computer science students, Seamus Dwyer, Caolan Melvin, Mark Noone and Michael McAndrew, who interned with Trinity’s IT services last summer. Its development was overseen by Dr Geoff Bradley, the Head of Academic Services, Innovation and Digital Platforms. “While that app was popular and innovative”, he added, “it needed to be redeveloped or replaced to keep pace with smartphone changes”. Prior to the launch of Trinity Live, some of the services if offers were available on the Trinity MyDay smartphone app, as well as on the myTCD online portal. MyTCD came in for criticism for being unfit for purpose after many students were forced to wait hours to access their exam results in January. A separate app, Trinity ID, acts as digital identification if students do not have the T-card with them. In a press statement, Prendergast commended the students and IT services on the launch of the app, describing it as an example of student innovation in action. IT Services hopes to secure funding to further develop the app, which is now available for download on Apple and Android devices. Last year, Trinity Calendar (Tcal), an app set up by a Trinity student, was shut down by Trinity. College said the app, which allowed students to synchronise their timetables with the Google calendar platform, risked student data. In an email to students after the app was shut down, its developer, Rory Hughes, cited the “the unofficial integration” of the platform with College databases as the reason for the decision. Around 1,500 students opted to use this student-led service, with its popularity increasing through word-of-mouth praise of the app.